David Antony Reid’s award-winning guitars use a unique blend of indigenous and eco-friendly tonewoods with distinctive vault backs that take their inspiration from Renaissance-era lutes. 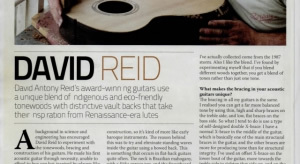 A background in science and engineering had encouraged David Reid to experiment with the tonewoods, bracing and construction of his guitars. He made his first guitar through necessity, unable to afford to buy one but inspired by players like Neil Young and Bob Dylan. Encouraged by his local guitar shop in Perth – Bandwagon – and local guitarist Pete Cobain, David continued to make more acoustics in his spare time. Having enrolled on a course in mechatronical engineering David discovered a guitar-making course in Glasgow and abandoned engineering for life as a luthier. Having gained a Higher National Certificate in musical instrument technology, he went on to study at the London College of Furniture. While studying, David won an award when his Renaissance lute-inspired vault-back guitar was voted Guitar of the Year by Guitar magazine. David is keen to reveal the inspiration behind this unique design which makes use of some unusual tonewoods. 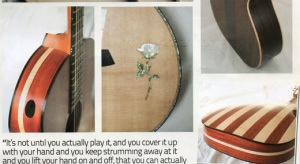 David Reid: It was basically a multi-strip back and sides guitar inspired by early lute construction, so it’s kind of more like early baroque instruments. The reason behind this was to try and eliminate standing waves inside the guitar using a bowed back. This is something that occurs in flat-back guitars quite often. The neck is Brazilian mahogany, with a Sitka spruce top, and the fingerboard and bridge are Brazilian rosewood. The vault-back is made from strips of pearwood and bird’s-eye maple. I wrote my dissertation on tonewoods and conclusion I came to is that people have conditioned themselves more towards a certain tone. People don’t always listen with their ears. This is what I’m trying to veer away from and encourage people to listen and hear that a lot of these woods have got a warmer tone rather than a sharp attacking tone. One of the things that encouraged me to actually use these woods is because, one, they’re indigenous to this country, and two, because I can use reclaimed stuff because you can use really thin strips of 35-40mm which are basically quite easy to get in reclaimed wood. I like to try, if I can, to use fallen trees, and a lot of these tonewoods I’ve actually collected come from the 1987 storm. Also I like the blend. I’ve found by experimenting myself that if you blend different woods together you get a blend of tones rather than just one tone. What makes the bracing in your acoustic guitars unique? The bracing in all my guitars is the same. I realised you can get a far more balanced tone by using thin, high and sharp braces on the treble side, and low flat and round braces on the bass side. So what I tend to do is use a type of self-designed double X-brace. I have a normal X-brace in the middle of the guitar, which is basically one of the main structural braces in the guitar, and the other braces are more for producing tone than for structural integrity. I’ve used an offset X-brace on the lower bout of the guitar, more towards the treble side to tighten that side up, and on the bass side I keep the guitar quite free. I realised that the treble side I bracing up quite heavily with long, high, thin, sharp braces was a little bit too stiff, and realised I could hollow out an area in that brace on the treble side but still have the strength because it was being pulled on all of the time. It still keeps its structural integrity but allows it to move more freely than it did before. One of the issues with that is that the bass side of the guitar is weakened because of the lack of bracing on it. I basically realised that if I could make a bridge across the scalloped area underneath the actual bridge area of the bass side of the guitar, I could turn that into something that would act like a spring. I got the idea from looking at the suspension on an old van. So what I do is bend and shape a piece of springy tonewood – sometimes I use Brazilian rosewood – (I also use Pernambuco, used to make violin bows) and then shape it with the plane so it keeps in shape, and then glue that over the scalloped area of the bass side of the X-brace. This tends to act like a spring but also gives it the actual structural integrity that it needs. There is a small hole in the side of the guitar – is this for monitoring? Yeah, that basically acts like a monitor. One of my frustrations playing guitar is that you can never truly hear it until you get someone else to play it to you and hear it actually project. So I decided to try it on that vault-back and basically it worked a treat – it’s absolutely brilliant because it does literally project the sound to you as the player so you can actually hear all the overtones and stuff. It just gives you the real clarity of the guitar. It’s not until you actually play it, and you cover it up with your hand and you keep strumming away at it and you lift your hand on and off, that you can actually hear the difference that it makes. It does tend to change the resonance of the guitar; I’m basically experimenting with it to see how that actually does change it. It seems to kind of lower the tone if anything, I think. The white spruce tends to sound a little less sharp and attacking, it’s more rounded and warm. I do like it but it’s quite plain aesthetically so there’s not a lot of people that are that drawn to it. I would liken it to Adirondack spruce basically – it’s not as great a tone but it’s a good substitute because Adirondack’s so hard to get. I just use a basic finish, because one of the most fundamental things about these guitars is that if you don’t cover it entirely with this hard, thick gloss lacquer it actually allows it to sing. People want to see this shiny guitar – they want to see this glossy thing because a lot of people don’t look at it as a sort of playable tool; they think of it as an ornament as well. So I’ve been trying to encourage people away from that and just literally apply several thin coats of nitrocellulose lacquer using matt because it works better with it. I don’t use any grain fillers either because using all these fillers just clogs it up entirely. So that’s one of the other reasons why I’m so happy with it.